OpenWheelWorld.Net >> Down But Not Out, Bourdais Pulls Off Emotional Come From Behind Win! Down But Not Out, Bourdais Pulls Off Emotional Come From Behind Win! When something works, it just works. Such is the case of the pairing of driver Sebastien Bourdais and his engineer Craig Hampson, who celebrated many championships together prior the merger of Champ Car and the IRL. So when it was announced in the off season that the newly rideless Bourdais was being reunited with Hampson and heading to Dale Coyne Racing, the consensus was that things could turn around for DCR, and the potential for podiums was high. But that notion was put on hold on Saturday when the tenured driver stuffed the car into the tires during round one of qualifying, relegating him the back of the field to kick off the 2017 season. 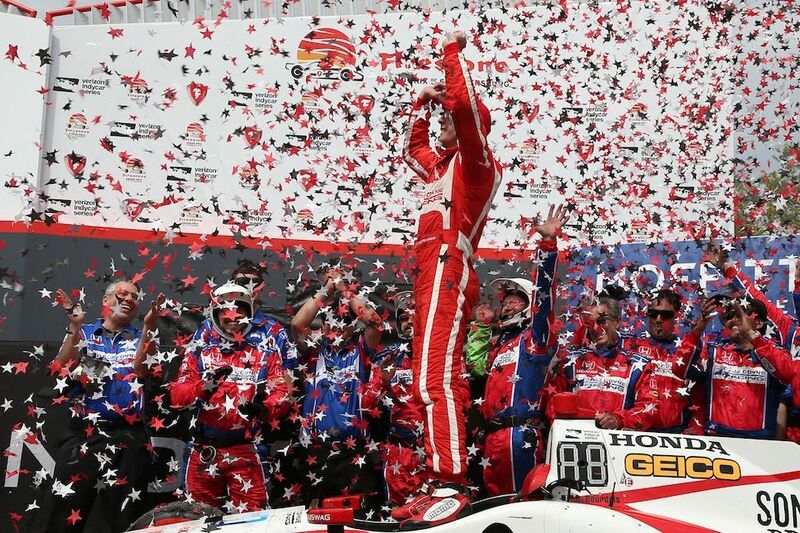 Against what should have been insurmountable odds, Sebastien Bourdais drove from the back of the field at the drop of green flag, to take the checkers and the first win of the season for himself and new team Dale Coyne Racing. Bourdais, who made his rocky IndyCar debut with Dale Coyne Racing post merger right here in St. Petersburg by essentially destroying the car on the front straight during qualifying and sitting out the race, was very emotional during today's Victory celebrations, the weight of the past, the off-season stress, and the frustration of the weekend seemingly lifted. The 110 lap race ran mostly incident free, save for a bit of minor bumping and banging. 7 time St. Petersburg pole-sitter Will Power lead the field to the green flag, and cleanly through the notorious turn 1, but as the field made it's way towards the new reconfigured turn 3, Graham Rahal squeezed Charlie Kimball into the outside wall, sending him and debris across the track, collecting Carlos Munoz. Several other cars to picked up and lost bits of carbon fiber, leading to a flurry of activity in the pits and a 4 lap clean up. All cars would return to race after minor repairs. On the lap 5 restart, Schmidt Peterson's James Hinchcliffe got around Power to take the lead, the first time since his 1st IndyCar series win on this track in 2013. Seemingly shot out of a cannon, the Canadian pulled away to an almost 5 second gap on the field. On lap 26, with Hinchcliffe still in the lead, mid early fuel stops, Tony Kanaan post stop and on cold tires, squeezed and made contact with Mikhail Aleshin through turn 4, showering the track with debris, and bringing out the second full course caution of the race for clean up. Again both cars only saw minor cosmetic damage, and would return to the action after repairs. 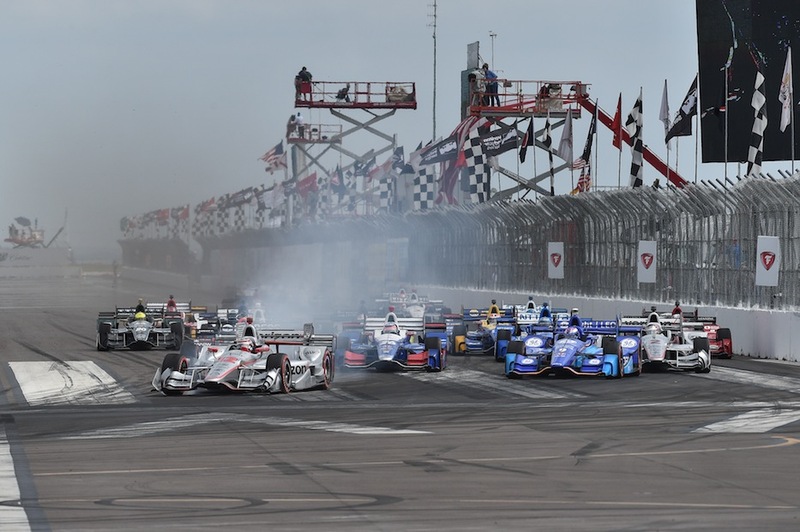 The leaders ducked into the pits, handing off the lead to defending series champion Penske Racing driver Simon Pagenaud, who would lead the field to the green on the lap 30 restart. With the remainder of the race running caution free, much to the chagrin of the ABC Analysts and their new toy the "Caution Probability Predictor" *insert massive eyeroll here*, Bourdais was able to not only maintain the lead, but pull out a comfortable gap over second place finisher Pagenaud. Ganassi's Scott Dixon rounded out the podium in third. With today's win, Bourdais now takes over 6th spot on the "All-Time" wins list, with 36, surpassing IndyCar legend Bobby Unser. 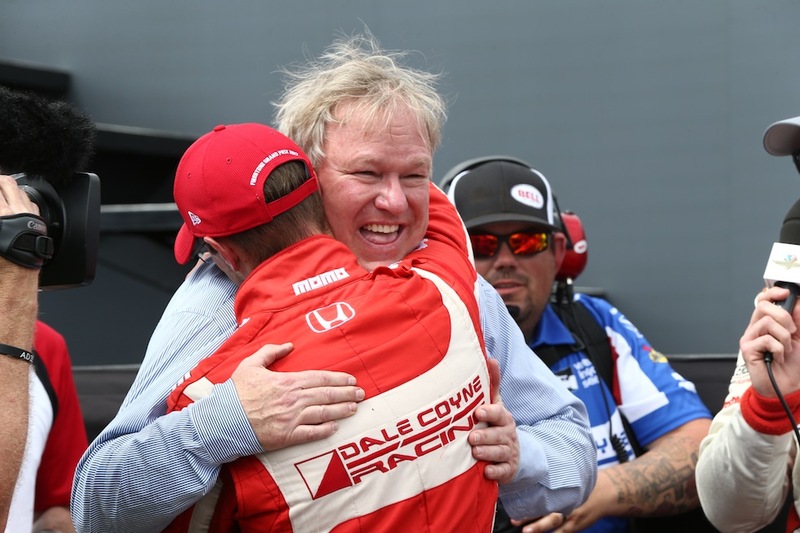 This gives Dale Coyne Racing it's 5th IndyCar Victory, and marks the first time the team has lead the season Championship, a fact that puts a smile on every IndyCar fan's face, no matter what team they normally root for all season. 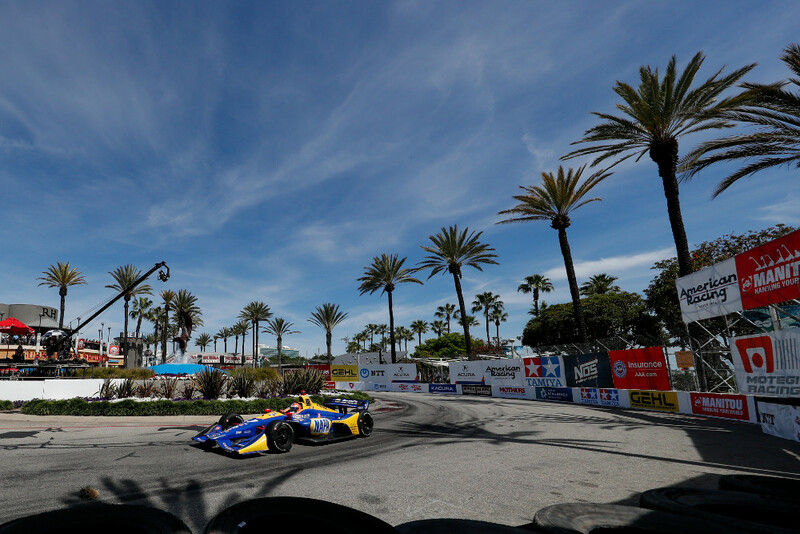 Join us 4 weeks from today on April 9th in Long Beach California for Round 2 and 43rd running of the Toyota Grand Prix of Long Beach. SEBASTIEN BOURDAIS (No. 18 Dale Coyne Racing Honda, Firestone Grand Prix of St. Petersburg winner): "A lot of things come back. I caught myself thinking about 2003, when obviously we started the opposite. We dominated the weekend, were on pole, cleared the field, then all hell broke loose. I found myself tapping the wall in Turn 8, threw it away. It was kind of redemption day here. To come out on top with obviously a lot of friends and family on-site, the whole community supporting the effort, it was just a great feeling. I couldn't really be any happier for Honda and Dale for giving me the opportunity to put the band back together and make it happen. Everybody works really, really hard. We're a small group. There is nobody at the shop that doesn't travel. But it works. It's a great little group. We're sure not going to stop there. We're just going to keep on trying." SIMON PAGENAUD (No. 1 PPG Automotive Refinish Team Penske Chevrolet, 2016 Verizon IndyCar Series champion): "It's definitely a champion team for regrouping like they did, understanding the issue we had in qualifying. This morning in the warmup, I was back home in my car. It was great to get that feeling back. The race, the car was fantastic. We got very lucky at the start, I would say. We went through the chaos. I think God had something to play with it actually, because he put the car back where it needed to go. Very lucky. Then after that, we were a bit lucky with strategy. But that was actually the plan. So thanks to (strategist) Kyle Moyer and (engineer) Ben Bretzman for their work on that. They gave me some clean air. We had to save quite a bit of fuel to manage till the end. (Sebastien) Bourdais was untouchable today. It's 1-2 French. Sorry for the French Revolution, guys. I'm very happy for him. It's been his hometown actually. He's been here since he moved to America. With Dale Coyne and Honda, they've shown a lot of strength. Fantastic for them. I wish it was P1 for me, P2 for him. Next time maybe. But very happy for him. Very happy for second. We started second last year as well. Hopefully it's our good luck charm." SCOTT DIXON (No. 9 GE LED Lighting Honda): "It started off a little bit rough. We lost a spot at the start and then there was the mysterious caution. It was a bit strange - I don't know why they were yellow for such a small piece of debris that wasn't even on the racing line. That pretty much put us in the toilet right there. I will go see what the story was there. We had good speed and a good GE LED car to overtake. We passed a lot of cars both on strategy and on-track. It wasn't the day we had hoped for obviously but it was better than a lot of other results we've had here over the years." More post race analysis and quotes to follow. To post comments, it is required to log in. Click here to log in or create a new account! Which Rookie will lead the 2018 ROTY Class coming out of St. Pete?